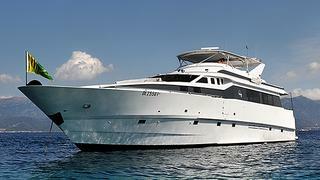 The 28.6m motor yacht Trilogy is sold as Jim Acher at bluewater tells me he acted for both buyer and seller in the deal. Built in GRP by US yard Tempest Marine to a design by Adam Erdberg, Trilogy was delivered in 1990 and had a substantial refit in 2005. The refit included a hull extension, new paint, new air conditioning, new teak decks, major works to all machinery and upgraded electrical systems. Featuring an enclosed pilothouse, Trilogy has four cabins for eight guests. Accommodation is laid out as a master suite, VIP suite and two twin cabins, all with en suite bathroom facilities. Twin 1,000hp Caterpillar engines give her a cruising speed of 13 knots and she is fitted with Naiad zero speed stabilisers. Her deck areas are extensive and offer several separate locations for al fresco entertaining and dining.